Check out SeatGeek for the best deals on NFL Tickets. The halfway point of the NFL is upon us, with every team having played eight games (with four having played nine). Like every other season, there are disappointments and surprises, teams that are either over or under performing. These aren’t teams like Buffalo, or Denver, or even Detroit. Those teams were expected to be bad. There are five teams that have really underperformed in a way. One of them is Dallas, who was covered on their own in a previous post (the Cowboys’ mess deserved a post all their own). The other four are a mix of awful teams, to average teams, but the common denominator is that all of these teams entered the year with optimism, and now all of it has vanished. The lineup has the 1-7 Panthers (who entered the year with the optimism of a 8-5 finish to 2009), the 3-5 Vikings (who traded and released the “savior” of Randy Moss and still have disappointed), the 2-6 Cincinnati Bengals (who have dropped five straight after trading for the T.Ocho show), and the 4-4 Redskins. The Redskins may seem like they don’t belong, but the controversy around Mike Shanahan and his feud with Albert Haynesworth and then his peculiar benching of Donovan McNabb makes them a disappointment as they seem to be as unstable as ever. All of these teams have suffered defeats and controversy, but have they suffered a drop in fan intensity and interest? The Bengals are up first, because they have probably dropped the furthest. The Bengals were the defending AFC North Champions, which is no small feat. Both teams that competed in the 2008 AFC Championship Game came from the AFC North, and the Bengals swept both those teams on the way to a 10-6 season. In half a season, they have lost as many games, as well as gone 1-2 in the division. What more is that the Bengals entered the season, on paper, a better team than they were in 2009, with Terrell Owens joining his buddy Chad Ochocinco. The Bengals were a team on the rise, with a bunch of good young players on defense, and with a healthy Antwan Odom back from injury after he was leading the NFL in sacks at the time of his injury. The Bengals were ready to hunt. One play into the second half of the year, the Bengals were down 31-3. They ended up making their opener slightly close, and went on to win the next two games, but have now dropped five in a row. None of the losses were embarrassing, none were blowouts, and they have kept playing hard, but five straight losses are what they are. Strangely, though, the prices have not followed the team in their nosedive, and have stayed relatively high, but that is all due to the bye-week effect. 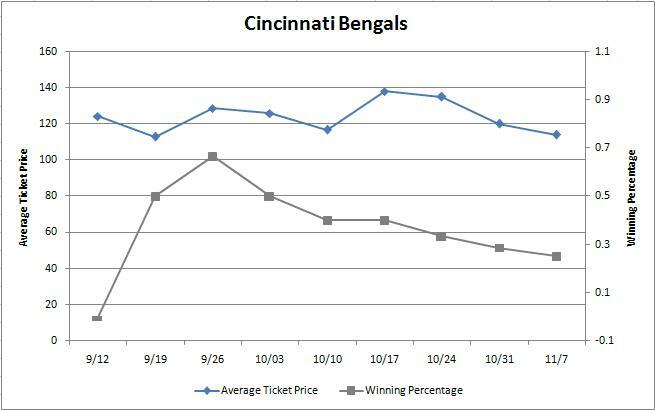 A couple of weeks ago, we analyzed how ticket prices change in a bye, and the evidence showed that teams that entered the season with a lot of optimism around them (like the Bengals) saw their prices increase over the bye, regardless of how the team was actually performing. That is why you see a large increase in the Bengals ticket prices from 10/10-10/24. Since 10/24, the day of their post-bye loss to the Atlanta Falcons, their average ticket price has been replicating their winning percentage, in a slow steady decline. The Bengals have lost all hope of making the playoffs, but are still a young team (outside of wide receiver), so their future is not totally dark, but for 2010, the season is essentially over, and in a usually transient fanbase, that might be trouble for the price of tickets. Next up are the Carolina Panthers. They probably are one of the stranger “disappointments” but they had some sleeper love heading into 2010. After an 8-5 finish to the 2009 season, including a 4-1 end with new starter Matt Moore, the Panthers were a team on the rise. There was a lot to like about them. They had a QB who did not throw interceptions, a solid, efficient defense, and the league’s best running game, essentially the formula they used for a 12-4 2008 season. The Panthers do not have the luxury of a big market. Even if the team was one of the league’s best, the prices would not reach the heights of the bigger market teams, but that doesn’t mean the fans will still not pay less when disappointed by a disastrous season. The Panthers have stayed pretty constant, which is good for the Carolina ownership. 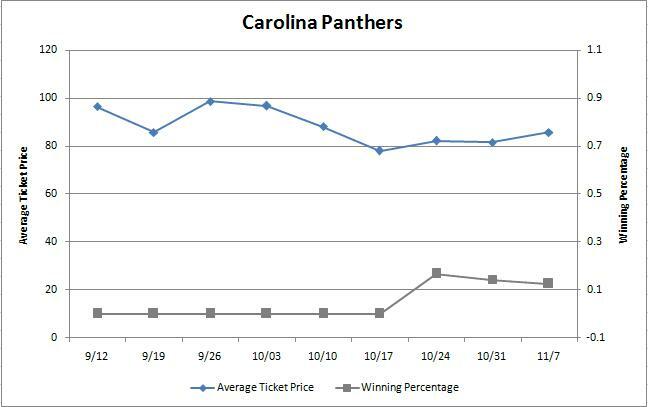 The Carolina Panthers fans seem to start at a baseline, and need to be persuaded by results to pay higher prices. The slight bump up after Week 2 ($85.7 to $98.6) is probably due to that third game being rookie Jimmy Clausen’s first NFL start, which was, for one week, a bright spot in a 0-5 start. Their first win over the 49ers did signal a slight uptick from $78 to $82.6. Now the price is continuing to creep up, but unless Jimmy Clausen starts winning games as the starter, the Panthers’ coffers will not be that full come the end of the year. People trying to find the “sleepers” heading into the season usually look for teams that ended the previous year well, but as the Panthers show, that is not always the best place to start. Batting third are the Washington Redskins, who despite their efforts to stabilize the organization by putting it in the hands of Mike Shanahan, are as crazy and controversial as ever. It started in the offseason. First, the Redskins pulled a trade for Donovan McNabb, getting him for a second round pick. Then came the game of chicken between Mike Shanahan and Albert Haynesworth (who, despite the reports, did not try to eat the chicken). Shanahan continued his power-play in the season, when he benched Donovan McNabb (in favor of Rex Grossman) for a critical 2:00 drive, citing McNabb’s lack of experience running his two-minute drill and McNabb’s lack of “cardiovascular endurance.” Dan Snyder hired Shanahan to calm the storm that usually builds up in Washington, and all Shanahan has done is make it a hurricane. Lost in all of this is that the team is 4-4, which is better than last year (4-12), but considering the wins the Redskins have, is disappointing. The Redskins have beaten the Cowboys (before we knew the Cowboys were the Cowboys), and beaten the 6-3 Packers and 5-3 Eagles (with Mike Vick starting). All that said, they start the second half still with the chance of the playoffs. 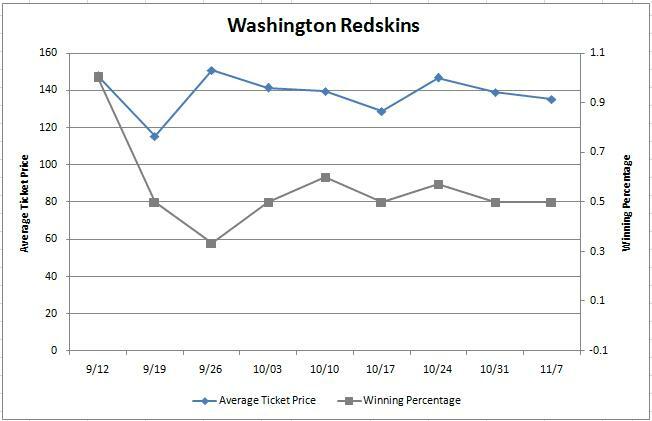 It looks like the Redskins average ticket price is about as volatile as the team itself. The Redskins are also have one of the strangest ticket prices over time. After their opening Sunday Night win, the Redskins saw their average price drop. Of course, a little drop was expected since the first game was a Sunday Night game against the rival Cowboys, but the next game was also a Colts team. Then, after blowing a huge lead to the Texans in Week 2, and with two road games coming up, the average price rose from $115.5 to $150.9. Then after their big win in Philadelphia, with two home games coming up against Green Bay and Indianapolis, the price dropped. After beating the Packers, and going to 3-2 and playing a Sunday Night game against the Colts next, the price again amazingly dropped from $139.4 to $128.8. The Colts are one of the better road draws and it was a primetime game. The Redskins ticket price then rose again with two road games coming up. No one ever knows what is going on behind the scenes in Washington, and no ones knows what is going on with the Redskins ticket prices either. Finally we get to the Vikings, who just as controversial as the Redskins and Cowboys. The Vikings entered the year as a supremely talented team that were turnovers away from rolling the Saints in the NFC Championship Game and getting to Super Bowl XLIV. Brett Favre was coerced back to the team (again), and although Sidney Rice got sidelined in training camp, the team was still one of the most talented teams in the NFL. Then, the season started, and the reality of a new season hit. Two close losses started the season badly. The Vikings were able to push out a win over the Lions, but that was only a momentary high. The bye started with rumors of Randy Moss, then the truth of the acquisition of Randy Moss. Four games later, with only one win and three more close losses to show for it, Randy Moss was gone, Brad Childress was nearly gone, and the team was back to being a controversial sideshow. For once, someone overshadowed Brett Favre, which is probably the only good Randy Moss did for the Vikings. Situated at 3-5, the Vikings are just two games back of the divisional leaders Chicago and Green Bay, but it seems so much more dire than that. 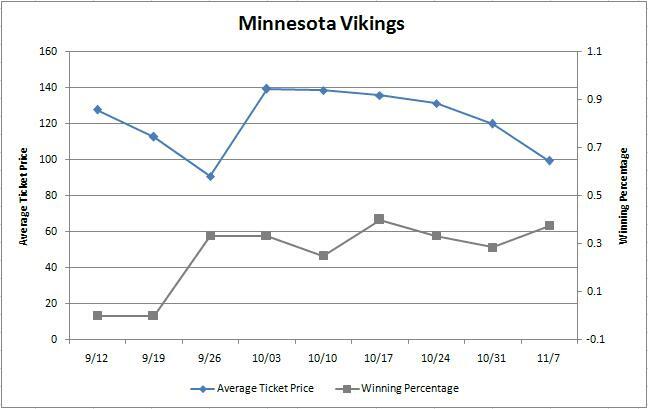 Unlike the Redskins, the Vikings ticket price over time map makes complete sense. The huge jump after their Week 3 win over Detroit was most likely not entirely due to the team winning a game (and having the Cowboys as their next home game), but due to one prodigal son returning home. What was the Moss impact? $90.7 average ticket price the week before the Moss trade. $139.4 the week that he was traded. Since then, it has been an increasing decline, and the loss to the Patriots seems to have been a critical point, as the price after the loss to New England dropped from $119.9 to $99.3 This is horrible news for the Vikings. Even if the Vikings make a charge at a wild card spot, Brett Favre will almost surely not come back for another season (although, it is Brett Favre). Vikings ownership wants a new stadium, badly. They have even threatened moving to Los Angeles as a ploy, which did not exactly work, but this decline in serious prices is not a good sign for getting a publicly-funded stadium pushed through. If any team needed a good year, it was the Vikings. The NFL season still has eight games left for all of these four teams. For the Bengals and Panthers, the season is most definitely over, but the Redskins and Vikings still have time to recover. The Randy Moss experiment did not work, and it looks like the McNabb era in Washington will be like most politicians’ eras in Washington, but the NFL is like a TV show, with surprises yet to come. Thoughts? Comments? Leave something here or tweet us up at @SeatGeek. ‘Till Next Time.